ICRP, 1993. 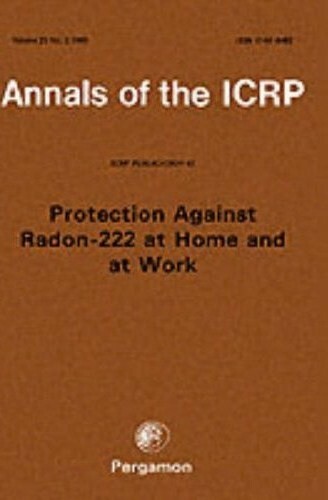 Protection Against Radon-222 at Home and at Work. ICRP Publication 65. Ann. ICRP 23 (2). Abstract - The naturally radioactive noble gas radon, (Rn-222), is present in the air outdoors and in all buildings, including workplaces. It is thus an inescapable source of radiation exposure both at home and at work. High radon levels in air can occur in buildings, including workplaces, in some geographical locations. This applies particularly in workplaces such as underground mines, natural caves, tunnels, medical treatment areas in spas, and water supply facilities where ground water with a high radon concentration is treated or stored. This report summarises the extent of current knowledge about the health effects of inhaled radon and its progeny and makes recommendations for the control of this exposure in both dwellings and workplaces. It aims to give guidance to national advisory and regulatory agencies and to practitioners of radiological protection concerned with radon in dwellings and workplaces. Once the decision to apply the Commission’s system of protection is made, it becomes necessary to apply an exposure limit. This has been derived to correspond to the same level of detriment as that resulting from an effective dose equal to the Commission’s recommended dose limit. Some additional guidance is given on practical control measures in workplaces. This publication includes a history of radon problems in mines and homes by Wolfgang Jacobi.